First, why do allergic reactions happen? Allergic reactions happen when a dog’s body tries to destroy a substance (like pollen), even though it isn’t harmful. Photography ©Kira-Yan | iStock / Getty Images Plus. An allergic reaction occurs when the immune system overreacts to something. The body releases antibodies and histamines in an effort to destroy the invading substance, even though the particular substance (food, pollen, etc.) isn’t actually harmful. What types of allergies might dogs have? With food allergies, dogs are allergic to one or more food ingredients, commonly proteins or carbohydrate sources. 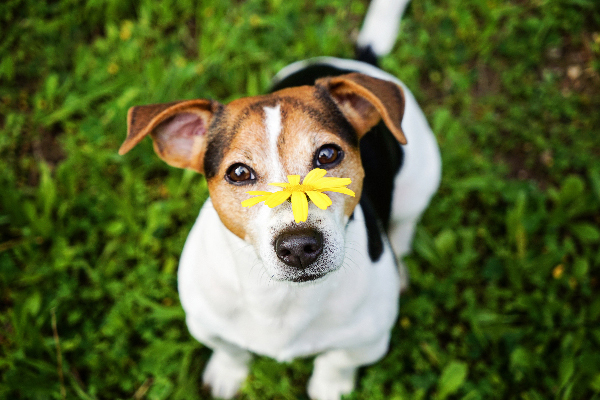 Environmental allergies are caused by anything your dog inhales, ingests or absorbs through his skin, including dust, pollens, grass, mold, smoke and more. Dogs are even allergic to flea bites, with some dogs developing more severe reactions to these parasites than others (see below). What do mild allergic reactions in dogs look like? Food and environmental allergies might cause troubling reactions like gastrointestinal upset (vomiting and diarrhea), itchy skin, ear infections, runny eyes or sneezing, but such reactions are rarely emergencies. If you notice possible allergy signs like chronic itching or stomach upset, it’s best to see your veterinarian, who will be able to root out the cause of the symptoms. When is your dog’s allergic reaction an emergency or life-threatening? Other allergic reactions, however, can be life-threatening. Dogs could be allergic to many things, but common culprits of allergic reactions in dogs include insect bites and stings, and vaccines. It’s important to learn how to recognize the signs of a severe allergic reaction in dogs, and what to do if you even suspect an allergic reaction. These allergic reactions in dogs can manifest as mild or severe. A mild allergic reaction might just be a little bit of facial swelling (eyes, muzzle or near the ears) or a few hives on the skin. Hives are small, raised bumps on the skin, which might be itchy. It can be hard to see hives if your dog has longer fur, but you might be able to feel them on the body. A severe allergic reaction, called an anaphylaxis, is a true emergency. With anaphylaxis, you might see facial swelling and hives, as well as vomiting, weakness, difficulty breathing, pale gums and sudden collapse. Untreated, dogs experiencing anaphylaxis could go into shock and could even die. “Because anaphylactic reaction can be rapidly life threatening, seeking veterinary attention is recommended,” says Claude Lessard, DVM, an emergency veterinarian at Veterinary Medical and Surgical Group in San Juan Capistrano, California. Waste no time getting your dog to a vet. This is true even for mild reactions because your dog’s symptoms might progress. If your dog is experiencing an allergic reaction during normal business hours, head directly to your vet hospital. It helps to call the hospital to let them know you think your dog is having an allergic reaction and that you’re on your way. If your dog seems to be experiencing an allergic reaction after hours, take him to an emergency vet. Should you ever treat your dog’s allergic reaction at home? Many dog owners wonder if they should administer an antihistamine like diphenhydramine (Benadryl) if they suspect that their pet is having an allergic reaction. Dr. Lassard does not recommend attempting to treat your dog’s allergic reactions yourself at home without explicit instructions from a veterinarian. What if your dog has an allergic reaction to a vaccine? If your dog ever experiences an adverse reaction after receiving vaccinations, head back to the clinic, calling to let them know you are on your way and that your dog appears to be having an allergic reaction following vaccinations. In the future, always tell veterinary caregivers that your dog has experienced a vaccine reaction. For some cases, the vet might want to pretreat your dog with certain medications before vaccinating to prevent another reaction. Or, the vet might recommend avoiding all future vaccines for your dog. Thumbnail: Photography ©bruev | iStock / Getty Images Plus. The post Everything to Know About Allergic Reactions in Dogs appeared first on Dogster.